I wish I could give you some amazing story about what I've been up to this past month that has kept me away from this blog; some grand adventure that taught me the ultimate recipe to living. The truth, however, is much more Anna-esque: I lost the USB cord to my camera and haven't been uploading pics. ***cricket noises*** I know, I know, I'm ashamed. Especially since it ended up being neatly rolled up in my organized box of cords. See? New Years resolutions of being more organized have upset my sense of order in chaos. Despite the lack of online presence, I have been quite busy these past few weeks. There were cakes and cookies and spreads made, and now that the pictures are on my computer I'll tell you about all of them, but the very first thing I want to share is the dish I make whenever I'm at home in the afternoon. Whenever my fridge declares that if all I put in is celery then what the heck can I expect to pull out, but celery? P.S. I am not a fan of celery and yet the sucker keeps finding it's way into my home. As long as I can convince an avocado to join me for a meal, this dish gets made. It's extremely fast, it's super easy, it's all made in one pot, and I daresay it's even sort of healthy. Sort of. 1. 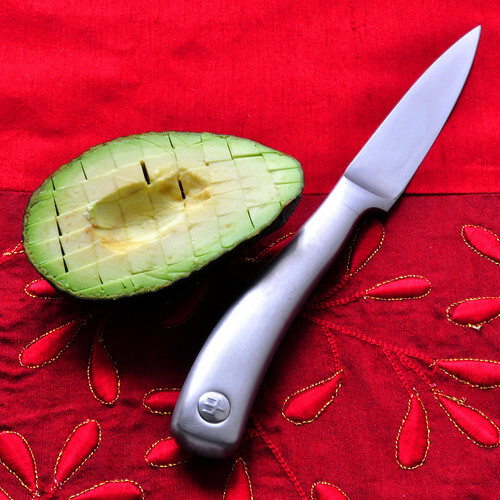 Cut an avocado in half around the pit and twist the two halves to separate. 2. Holding the avocado in one hand (keeping your fingers, palm, etc. as out of the way as possible unless you really like that cute nurse in ER and would like stitches) whack the knife into the pit and twist it out. This part will make you feel like a ninja. Feel free to make "hiyaaaa" noises, I won't tell. Okay, sorry. I told you I get very excited about cutting up avocados. Lets agree that I'm a dork and move on with the recipe. I found this recipe over at Tea & Cookies almost a year ago, and I remember immediately going to the store and getting a box of quinoa and a bottle of Ponzu sauce, neither of which have ever stepped foot in my kitchen before that. The recipe comes from China Forbes, lead singer of Pink Martini, whom I've discovered long ago and whose "Dosvedanya Mio Bombino" and "Hang on Little Tomato" have been in heavy rotation on my iPod for years. The recipe itself is warm and comforting, smooth and salty, a little bit sushi-esque, and altogether delicious. Try it, you'll like it. Cook the quinoa in 1 cup water according to package instruction. Basically bring to a boil and simmer for about 20 minutes until the water is absorbed. 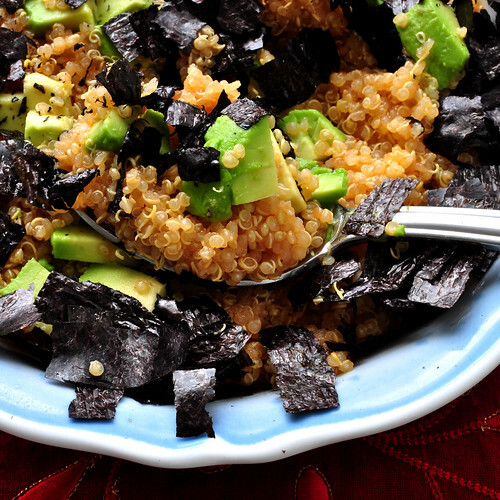 Yellow quinoa will get soft, black quinoa stays a bit firm and seedy. Drizzle in the ponzu, sesame oil, and chili sauce right into the pot, stir in and dump into one or two pretty bowls (depending on how hungry or willing to share you are). Cut the avocado in chunks and dump on top. Sprinkle with nori strips. Stir, eat, and swoon. That looks so good, I love quinoa! that is my technique too, so easy and uniform. Isn't that recipe yummy? I haven't made it in awhile—thanks for the reminder! Would you believe that I recently cut an avocado like this for the first time, too? I love popping the knife into the seed the most! I've had some bad experiences with quinoa. Not enough soaking time, I think. I'll have to try again! Abby: You just made my day. The ninja knife move is my favorite part too and I feel so much better knowing that not everyone always knew this technique. It does make you feel like a Ninja, doesn't it? Oh, this is such a cute post, Anna! yum yum! looks delicious AND HEALTHY! So this is what you do when you are cleaning out your fridge. I make pasta.